ALMA, the Atacama Large Millimeter/submillimeter Array, was officially inaugurated today in a ceremony that brought together representatives from the international astronomical community. Today's event marked the formal beginning of ALMA's decades-long journey of discovery. Able to observe the Universe by detecting light that is invisible to the human eye, ALMA will show us never-before-seen details about the birth of stars, infant galaxies in the early Universe, and planets coalescing around distant suns. It also will discover and measure the distribution of molecules -- many essential for life -- that form in the space between the stars. "ALMA was designed to be an incredibly powerful tool for discovery, not for just the current grand challenges in astronomy and physics, but also for new mysteries we have yet to encounter," said Tony Beasley, director of the U.S. National Radio Astronomy Observatory (NRAO), which oversees the North American portion of the project. ALMA truly is a cutting-edge observatory. Its superconducting receivers, which detect the faintest whispers of millimeter and submillimeter light, will operate at just a few degrees above absolute zero. The telescope's antennas are engineered to the highest possible tolerances so they can accurately collect and focus signals from space. Bringing it all together is the ALMA correlator, a specialized supercomputer that will perform as many calculations per second as 3 million laptop computers combined. With this technology as its foundation, ALMA will peer deep into space with unprecedented sharpness and sensitivity. ALMA will create highly detailed images of the disks of dust and gas that give birth to new stars and planets. It also will study failed stars known as brown dwarfs, the distribution and nature of dark matter, and the formation and evolution of galaxies across cosmic time. One of ALMA's most intriguing areas of research will be astrochemistry: teasing out the telltale signals that complex and biologically interesting molecules naturally emit. 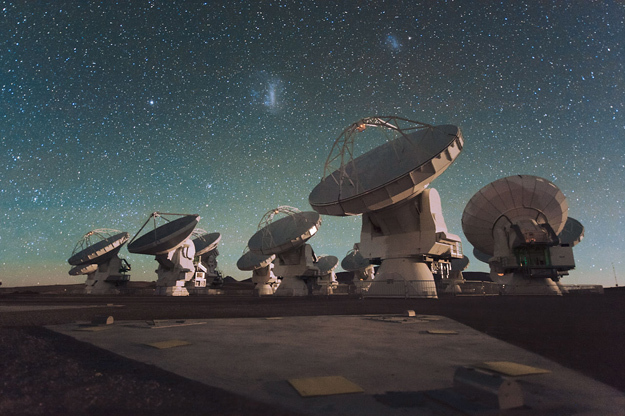 ALMA is located in the Atacama Desert of northern Chile, one of the world's best sites for observational astronomy. At an elevation of 16,500 feet (5,000 meters) above sea level, ALMA is the highest telescope array on Earth. This rugged area with its Mars-like terrain was carefully selected for its pristine views of the cosmos and arid environment. This is essential because the light that ALMA will detect is easily absorbed by atmospheric moisture. "The best telescope on Earth deserves the best location on Earth," said Ethan J. Schreier, president of Associated Universities, Inc. (AUI), the NRAO's management organization and the employer of ALMA's local Chilean staff. "ALMA could never have reached its full potential were it not for the willingness of the Chilean government to work alongside the U.S. National Science Foundation and all our international partners on this bold scientific venture." Today, more than 500 representatives from the international science community gathered at the ALMA site to inaugurate the new facility. Subra Suresh, the director of the U.S. National Science Foundation, represented the United States. He was followed by a congratulatory video from U.S. astronaut Tom Marshburn and Canadian astronaut Chris Hadfield, both on board the International Space Station as part of Expedition 34. NSF Director Suresh also was joined by Chilean President Sebastian Pinera and representatives from ALMA's international partners: Tim de Zeeuw, the director general of the European Southern Observatory (ESO); and Teru Fukui, the senior vice minister of Japan's Ministry of Education, Culture, Sports, Science and Technology (MEXT). Other ALMA executives and personnel as well as representatives of the neighboring communities also attended. The North America ALMA Science Center, which coordinates and supports ALMA research projects for all North American astronomers, is part of the U.S. National Radio Astronomy Observatory (NRAO) headquartered in Charlottesville, Virginia.